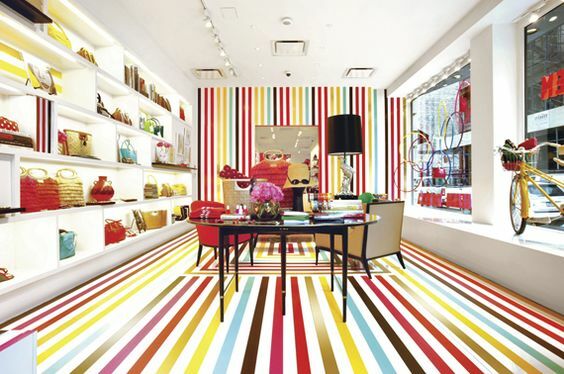 A Kate Spade store interior. The Americana iconography and pop colors attract a coveted market segment attractive to luxury brands. Image source Pinterest. Kate Spade, the American fashion house known for kitschy, colorful lines of clothing and accessories, will be purchased by luxury retailer Coach for $2.4 billion. The deal comes as the crowded luxury market competes with fast fashion and e-commerce brands. Why is the Kate Spade brand so attractive to a traditional luxury brand like Coach? The unique twist on fashion and attainable price point has attracted the coveted millennial buyer. Kate Spade has a truly unique and differentiated brand positioning with a broad lifestyle assortment and strong awareness among consumers, especially millennials. While Coach handbag prices can top out at $3,000, Kate Spade targets the entry-level luxury consumer with prices between $100-500. Building this multi-level brand is part of the Coach strategy to attract and retain consumers as they move through income levels and age brackets.